How could 2014 pass without having our biggest event of the year, GDG DevFest Nyeri? Last year’s event was the debut event in the DevFest series. 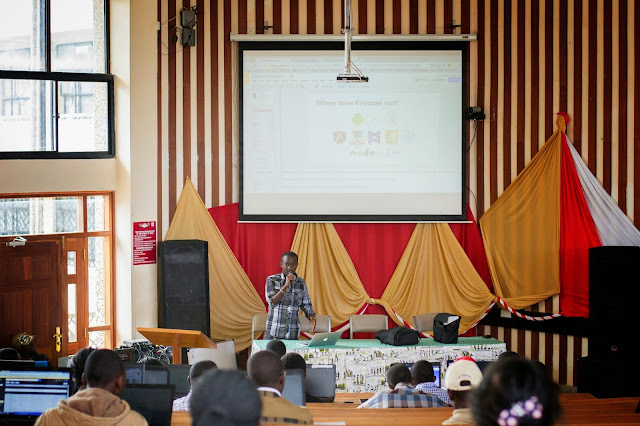 As last year, together with GDG Mombasa, we finished the DevFest series in Kenya. I think, it has become a habitual thing…. 2013 had focused on Google Cloud (App Engine), Mobile web development with HTML5 and abit of Women in Tech. This year it was themed on Polymer Polytechnic, Real Time Data Processing with Firebase, Women in Tech, and lastly a StartUp X hour. 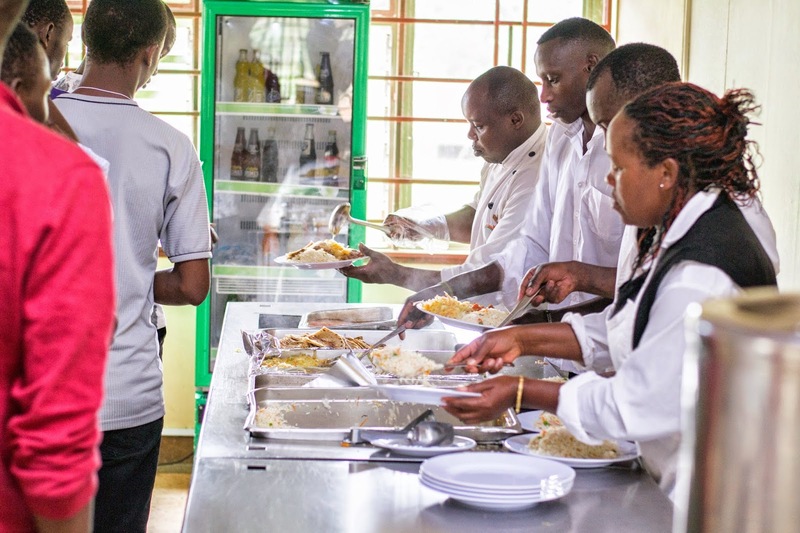 The event was held on 29th November, 2014 at the Dedan Kimathi University of Technology (DeKUT). It brought together 100+ tech developers and more than 8 speakers. People travelled from all over the country to Nyeri, making a conference of interesting speakers and enthusiastic audience. The doors were opened at 9:00 am, by that time most of the developers had lined up at our registration booth. They were warmly welcomed by the registration team. Everyone produced their tickets, their names were checked in the Eventbrite list after which they were allowed to get in. Immediately after, we had a short break where everyone got a chance to enjoy the morning snacks and free coffee, this also provided a short networking session where the attendees met old friends, made new valuable ones and even changed contacts. The participants were now all energized, excited and ready for tech talks. +Joseph Ndungu then took to the stage, he asked the congregation if anyone knew about the recently Google acquired Firebase. 99% of the attendees never knew what it was! Then he started to explain, it was an incredible first experience! None of us could imagine that someone else could deal with the nightmares of real-time data scaling and security. The Cloud service provides application developers with an API that allows application data to be synchronized across clients and stored on Firebase's cloud. We were also amazed that firebase includes a user management system where by developers can enable user authentication with email and password login all stored with Firebase. 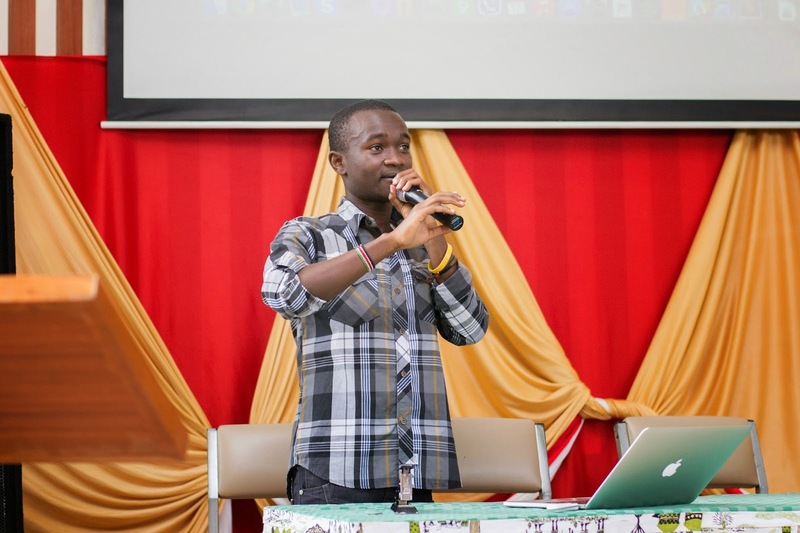 He advised the audience to later apply the knowledge in building real-time mobile and web apps using client-side code and the powerful API as it saves time. The beauty of coming together to share new ideas and new products in the market! And then Guess what? 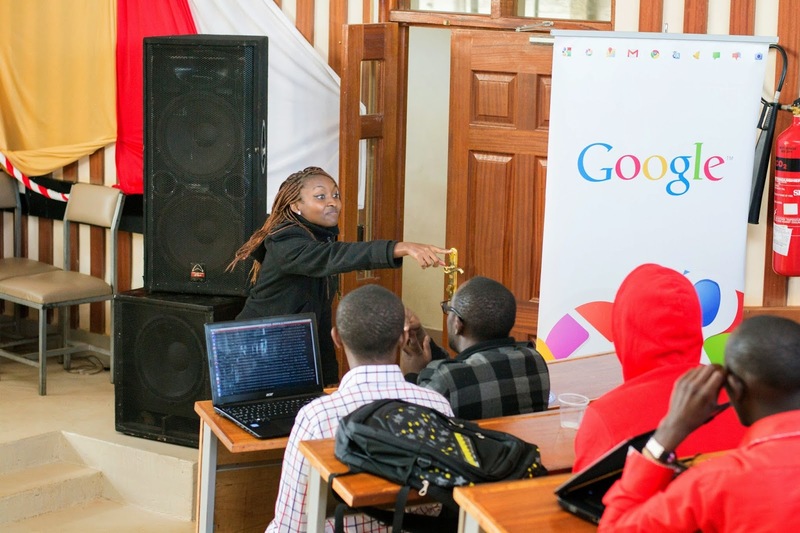 After such an awesome tech talk, GDG Kimathi University organizers took the audience through a brain teaser session. Everyone was to stand up and do nothing else except what Sam says. All those who did otherwise sat down amid laughter. They were caught off-guard. The last few ladies and gents standing were promised some goodies at the end of the event. Thereafter +Kenneth Kinyanjui took it up again and talked about the polymer. The polymer Project helps developers deliver amazing user experiences by unlocking the full potential of the web platform. Developers can use the Polymer Library to make the most of Web Components, a powerful new platform feature for extending HTML and componentizing your apps. He also talked about Entrepreloper. Entrepreloper is unique new word formed when Entrepreneurship and Developer are fused together. He highlighted on the importance of having the two skills in a developers mind. He emphasized on the importance of passion, hard work and persistence. “With them nothing is impossible!” he concluded. At exactly 1:00 pm, we went for lunch break. We enjoyed the meal after which participants mingled up and moved around getting to know one another. Soon after lunch break, we kicked off with a presentation from +Margaret Odhiambo who actually carried away the audience. “Anyone can do it, gender does not matter. The only thing you need to do is to make Internet your friend,” She Said. She told us her story on how she had to pay someone to access learning material without knowing they were free on the Internet. Later when she realized it was free, she discontinued the class and made the Internet her best friend. She noted that most ladies took a back seat in technical stuff and always waited for men to help them in small programming tasks unlike men who constantly compete and post challenge to each other. She also encouraged ladies to make meaningful friendship with men in tech. Where are the Geek Ladies? 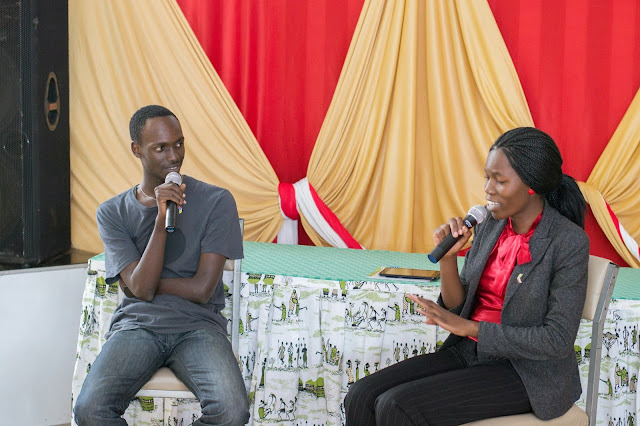 This was followed by a Q &A talk show style about ladies in tech hosted by with +Kenneth Kinyanjui and +Margaret Odhiambo. We had the opportunity of hearing different opinions from the developers on why most ladies don't have much interest in tech. Among a score of interesting participants we would like to highlight the speeches of few individuals. 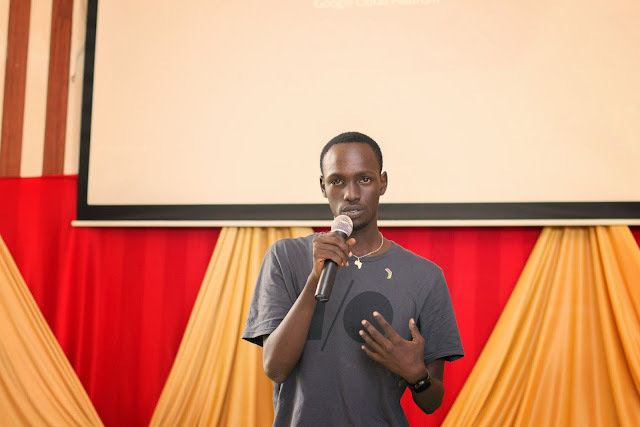 +Michael Githinji, one of the attendees, explained that only few ladies are celebrated in the tech world. People only hear the likes of Bill gates and Steve Jobs but hardly hear any female named in the tech. Therefore, without positive role models ladies don’t see the opportunities for themselves in technology as they don’t have people to motivate them. Another person also noted that it all boils down to culture. From a young age where most girls are influenced, ladies are told that boys are good at math and girls at language. This creates a perception that it is "too hard" or something that boys do. Therefore the ladies lack interests in the programming as they believe it’s a boy’s thing. 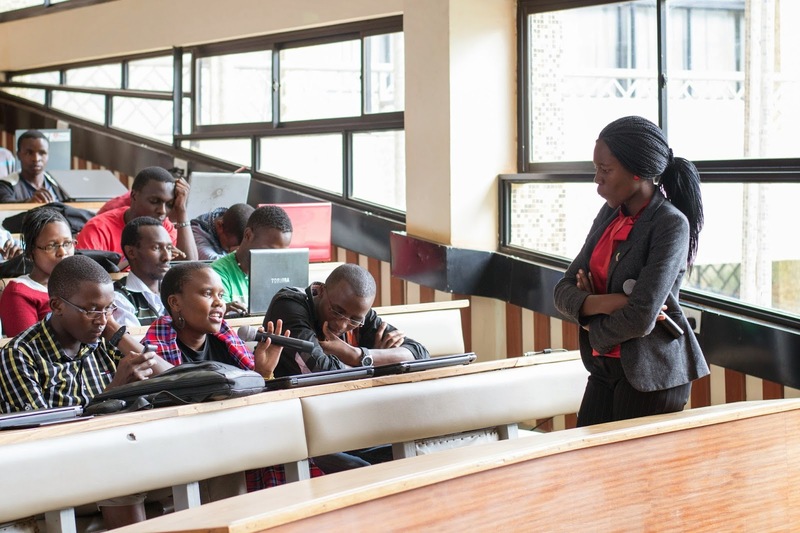 The good news is that GDG Kimathi University will put in place measures to try to reverse this trend by getting more women to consider actively participating and contributing in tech. We also want to pride ourselves on operating as raw meritocracies ready to embrace anyone with a good idea, regardless of their gender. 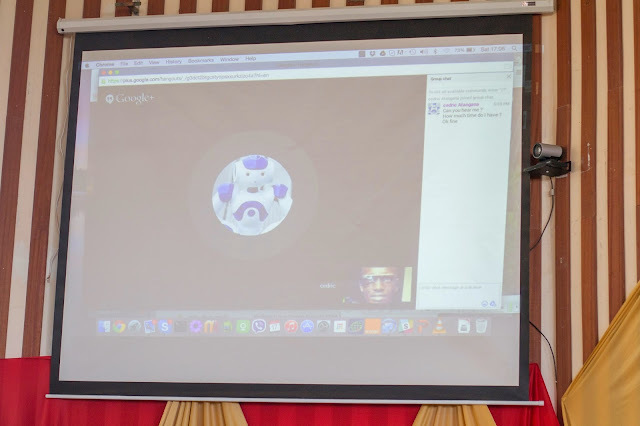 Moments after, Cedric Atangana (Lead, GDG Yaoundé) gave his session all the way from France via Hangouts. Cedrick is the founder of Infinity Space, a tech start up based in Kenya and Cameroon. He encouraged us to get behind our laptops and focus more on developing local content, building cool stuff that truly belong to us. He also reminded us about the opportunities that await such developers. After the Hangout, we went for another break where we took juice and snacks. Hey this is our Journey! The sessions resumed around 4:30 pm .During this time GDG Kimathi University pioneers took us through their success story. They shared with us on how they tapped into each other creating a strong network of tech enthusiasts. This resulted into a geek culture within themselves and after some time they thought of starting a tech community. That's how GDG Kimathi University was born. They emphasized on the importance of working as a team as it broaden everyone's skill set. The attendants also posted questions which were responded by the team. 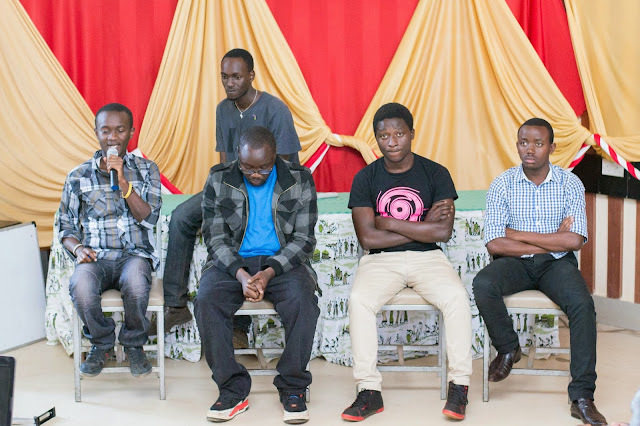 We appreciate these self-motivated young men who have been coding like banshees since they got into their network and created GDG Kimathi University. 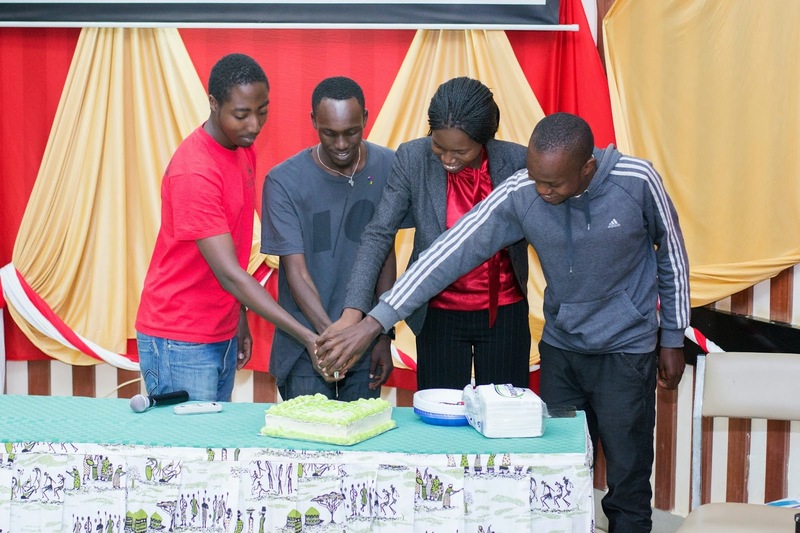 Happy Birthday GDG Kimathi University! A cake was then presented to the table, everyone was amazed when the cake was displayed as it was glazed and topped with GDG Kimathi university name. It was showered with party poppers and confetti! The Cake was then cut it into small pieces. In Between, we had exciting tracks singing the happy birthday tune which almost everyone joined in singing. 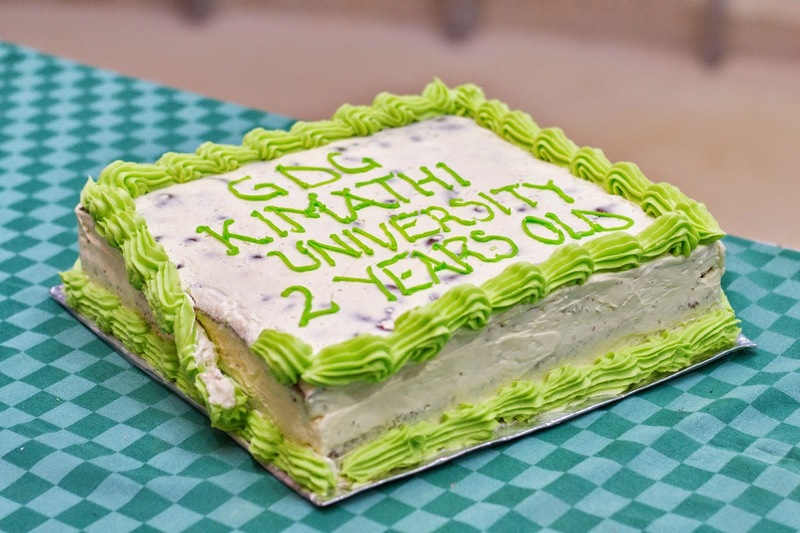 The pieces were then taken to the developers to mark the 2nd Anniversary of GDG Kimathi University. Finally, +Kenneth Kinyanjui gave his closing remarks. Everyone then got a free t-shirt and we all took a group photo. All were free to leave at their own convenience. GDG DevFest 2014 was another success! We would like to thank our sponsors, specifically Google for believing in what we do and valuing what we love to do most; building cool mobile apps, cloud apps and web apps that solve real life problems here at home and even beyond. Personally, I think GDG DevFest is the brightest Google-related event that happened this year. It provided a great learning opportunity for attendees as it reveal fresh trends in Google technologies which most can possibly implement in their future work. To our speakers and attendees, You were awesome! 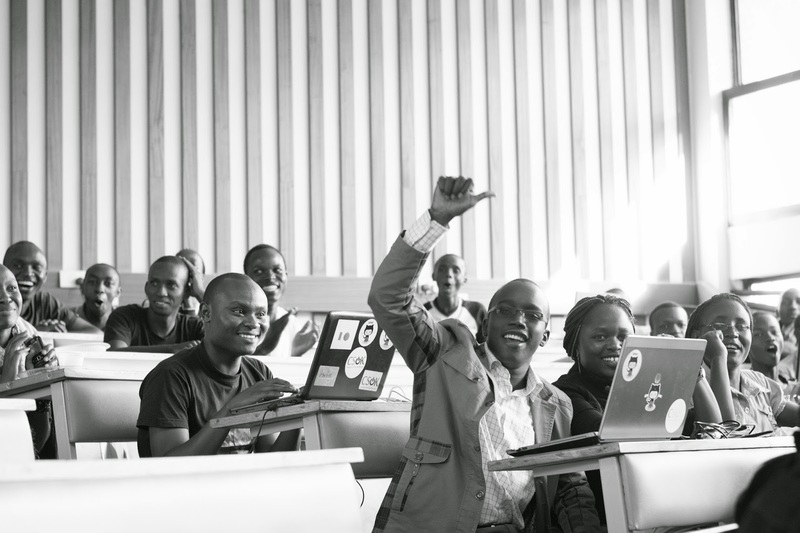 Let’s do it again next year, See you at the GDG DevFest Nyeri 2015!